As the silos continue to disappear in facility optimization and smart buildings, two significant technological evolutions impact the market. Moreover, when they get combined the consequences and opportunities become even more impactful. The first evolution concerns a technology present since the early days of IP telephony: Power over Ethernet (PoE). The second one concerns a technology that is still emerging, but has been evolving fast since end 2017: LiFi (light fidelity or visual light communications). In two blog posts, I will share why they are important to watch, how they affect smart building evolutions and what our partners can expect from us. This first post will focus on Power over Ethernet because it is already present in buildings and, more importantly, will alter the face of the connected building landscape in multiple ways later this year. Let’s start with a quick reminder on what PoE is. Power over Ethernet allows power and data to run over the same Ethernet cable. It isn’t new, it was ‘invented’ as a solution for IP phones, and has evolved with several IEEE standards. Offering more power and enabling more use cases since 2002, it is used, among others, to connect and power PTZ IP cameras, wireless access points, nurse call systems and alarm/access systems. In September, the long-awaited new PoE standard, IEEE P802.3bt, gets officially released. It’s a major gamechanger for smart buildings and the usage of PoE overall. The new standard offers up to 90-100 W of power for Type 4 devices and up to 55 W for Type 3 devices. As I explain in an interview on how the IEEE P802.3bt Power over Ethernet standard integrates cabling, IoT and smart buildings, designing a network that is ready for the standard will make it future-proof when considering all the new devices to connect and power. Moreover, with the pervasiveness of IoT increasingly changing the siloed approaches regarding building networks (a network for IT, a network for heating, one for energy management, offices, LAN etc. ), the new standard will be an additional gamechanger here too. In a State of Ethernet webcast last Summer, John D’Ambrosia, the Chairman of the Ethernet Alliance, which advocates multi-vendor interoperability, said that the expansion of the Ethernet ecosystem in a scope of PoE and BASE-T should mainly be seen from the perspective of lower-bandwidth applications whereby the devices need power, leveraging the twisted pair cabling infrastructure that’s already been put into place pretty much everywhere. This inevitably brings us in the space of IoT and of connected devices overall (with Ethernet in connected cars being another expansion of the Ethernet ecosystem). Since we use ever more IoT devices in smart buildings and ever more other mobile devices and applications in offices and other facilities, our increasing need for wireless connectivity and usage of bandwidth-hungry apps such as video, starts congesting Wi-Fi networks. The ubiquity of Wi-Fi and the fact that we use it all the time, even at the desk where Ethernet cables often remain jobless, inevitably contributes to this congestion and possibly even a real spectrum crunch. This is partially where PoE comes in and certainly LiFi as I will cover in my next post. At the core, the strengths and benefits of the new PoE standard are not (just) about bandwidth. The real race today is about power. If you just look at the number of IoT devices which are being connected in buildings (by 2021 over 10 billion devices according to Memoori) and how many of those need to be externally powered, it makes sense to leverage the network that is there. With Ethernet being the backbone of each building and PoE combining data and power over the same copper, all the unused twisted pair cabling infrastructure in buildings can do more than power IoT devices and thus applications and use cases in smart buildings. With PoE, we can also power our smartphones, tablets, mobile computers etc. without the need for AC/DC conversion and without needing to redeploy things in most cases. As a result, the Ethernet infrastructure in offices, for example, gets a new destination: address the need for power while at the same time saving on energy. At the occasion of the recent Global LiFi Conference in Paris, Emmanuel François of the French Smart Building Alliance reminded that PoE, as a DC power cabling system, allows for tomorrow’s buildings to be supplied in direct current, while today they use alternating current. The consequence? Switching to DC, without an AC adapter, means 25% in energy savings. It’s on, among others, the level of powering the mentioned devices without AC/DC conversion that this can be achieved. Furthermore, when using copper at the desk again, Wi-Fi congestion decreases and the right network is used for the right reasons. And as I said in the mentioned interview, nowadays DC power at the desk is not a nice to have, it’s mandatory. Saving energy is what facility managers want. Yet, PoE enables enhanced efficiency and savings on more levels than energy. Since the cable is already there, it is much easier to combine connectivity and power in a single cable and connector through a single installation, all the way from DC power source equipment (PSE) to DC power consumption by the PoE power device (PD). Last but certainly not least: facilities can save on copper, which is a precious raw material resource. 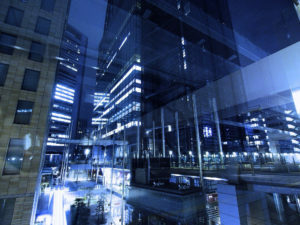 As ample research also confirms, the demand for PoE is there and it is clear that PoE will impact various areas of the smart building: from power for connected devices and IoT connectivity to use cases in-room control, lighting, overall building management and more. The first area where we’ve been calling upon our partners and the market to get ready for the new PoE standard was that of healthcare facilities. In 2016 we published a paper with recommendations for future-ready network connectivity in hospitals, advising to use Category 6A cables for facility connectivity and pointing to the increasing usage of PoE in hospitals. The higher capacities of the new standard would allow PoE to also provide power to larger pieces of equipment than at that time, including building automation devices such as lighting systems, presence detection systems, and HVAC temperature control. When Markets and Markets predicted that the PoE solutions market would reach over $1 billion by 2021, citing several inherent benefits such as the low installation cost, high convenience and reliability, the company mentioned the high demand for PoE technology-based products from office buildings as a key driver. Earlier this year, Tam Dell’Oro of Dell’Oro Group stated that the global Ethernet PoE switch market is surging, with 750 million PoE-enabled switches and hundreds of millions of devices expected to be delivered over the next five years. Momentum for PoE in smart buildings is picking up fast, the use cases are increasing, the demand is high and the benefits correspond to what facility managers want. The benefits of leveraging PoE aren’t just great for facility managers, PoE also enables our EcoXpert partners to create additional value. In smart buildings, connected devices and the ways in which they are connected and powered (the cabling and network communications) are the foundational level of everything on top of it: from edge controls, analytics and apps to the building management system. Customers want interoperable end-to-end solutions whereby all these levels are seamlessly integrated in the most optimal way. For partners, this integration of the essential levels of devices and cabling with all the other ones offers untapped possibilities to increase the value they generate and provide. It is strongly recommended that they combine skills on these various levels. In practice, that means adding a data communications certification badge to another one, such as BMS. Obviously, also new partnerships within the ecosystem can be forged. We are certainly ready to enable our partners and their customers to reap the benefits. Our S-One Connector has passed the tests of the draft of the new standard in our labs and now we just wait until the new standard is released before we get a third-party certificate. The cabling experts might wonder how we solved the challenge of warming-up with the new standard and the energy losses because of the copper and limited wire diameter. Here as well, we are ready with a topology that makes it possible to address the demand for PoE and generate that value. What the future will hold? As John D’Ambrosia said in the mentioned webcast: when he talks with people on PoE there is really no end with regards to where people want to use PoE and the use cases are mainly limited by the applications engineers and innovators see. It’s our role to keep innovating, the input of our partners is very welcome in that regard. So, I invite you to comment or get in touch and stay tuned for what the future certainly will hold: a second post in this series on LiFi and the combination of Power over Ethernet and LiFi.